Amanda is such a girly-girl turtle. She just loves pink! Amanda would be the perfect gift for any little girl (or big girl too) who also loves pink. 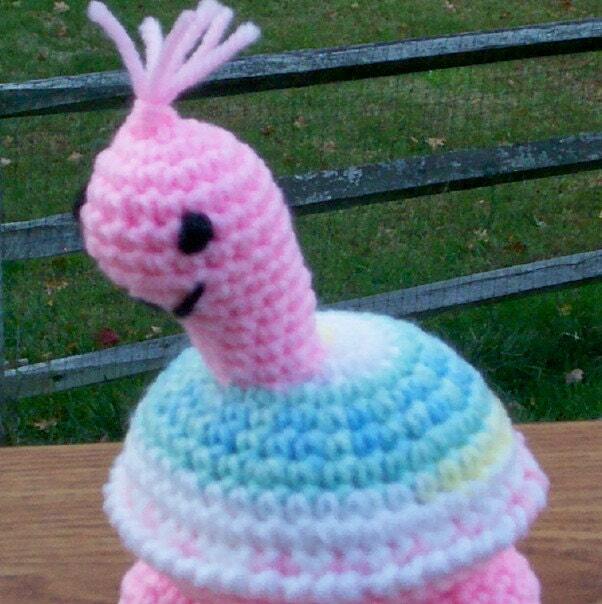 She would be a great baby shower gift for someone you know who is having a girl. Amanda’s head, feet and tail are a lovely shade of – what else – pink! Her shell is variegated, in pastel shades of pink, white, blue, mint green and yellow (placement of colors on shell may vary from the photo). I crocheted Amanda using 100% acrylic yarn and stuffed her with polyester fiberfill. She stands about 6.5 inches (16.5 cm) tall and is about 5 inches (12.7 cm) wide. Her eyes and sweet smile are embroidered with yarn, so she is child-friendly. I created Amanda in a smoke free, dog loving home, using a pattern designed by Sue of HappyWhosits. Shipping: Amanda will be shipped via USPS First Class Mail with delivery confirmation to customers within the US. International customers, including Canada, will receive their turtle via USPS International First Class Mail (delivery confirmation where available). Any duties or customs fees are the responsibility of the purchaser. Thanks for visiting Daffodil Corner.